Nicholas Martin knows people might believe he looks more like a guy who would carry a neighbour's groceries than like a drug user. "I think the stigma is the hardest part to get over," he said. "Some people automatically put this vision of an addict in their mind — or what an addict should look like." For years Martin struggled with what he calls "mood-altering substances," most recently heroin and fentanyl. He has since gotten help and is back on solid ground. The U-Turn Addictions Recovery Drop-In Centre is a big part of that. "I'm here every day," said Martin. "A huge part of recovery is giving back, which is something I do here." 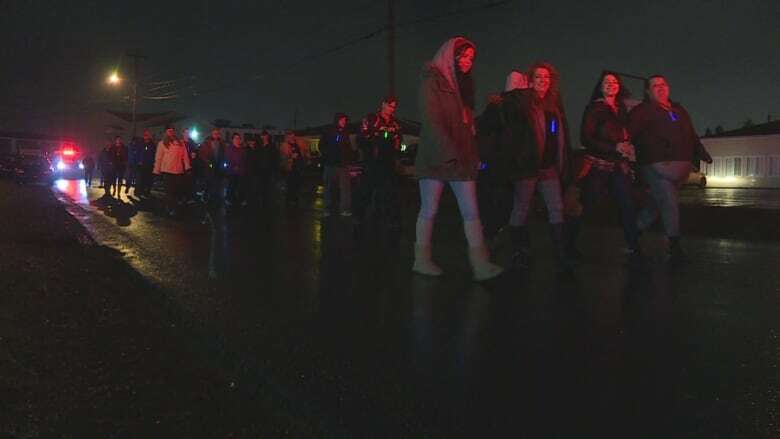 On Thursday night Martin and his daughter were two of about 80 people taking part in the 3rd Annual Addictions Awareness Walk held by U-Turn. The event coincided with National Addictions Awareness Week. "If we don't get vocal about addictions being in our neighbourhoods we will never end the stigma," said U-Turn's executive director, Jeff Bourne. "Even though there is a lot of awareness out there today, the stigma is still attached to addictions." Bourne said the idea of what a drug-addicted person looks like isn't what most people expect. "The view in some people's eyes of an addict is someone they see at the drugstore waiting to get their methadone drink," he said. "But it's not. It's all walks of life." Lead by the RCMP, the large group walked around Carbonear with lights flashing and sirens blaring. Following the trek around town, the group went back to the U-Turn centre for some snacks and speeches. As for Martin, he's currently studying at the College of the North Atlantic with his eyes set on becoming an addictions counsellor so he can help others with what he is battling. "I am somebody with the disease of addiction and there is help," he said. "Hopefully other people can see that there is hope and that recovery is possible."